The Baltimore Community ToolBank stewards an impressive inventory of tools to strengthen and celebrate our shared community. Gone are the days when your volunteers stand around waiting for an extra shovel or rake to be able to jump in and help. Now—whether it’s a school playground, a community garden or an abandoned lot that needs some extra attention—our community partners group have enough tools and equipment to focus on their important work in service to others. The Baltimore Community ToolBank is part of a national movement. 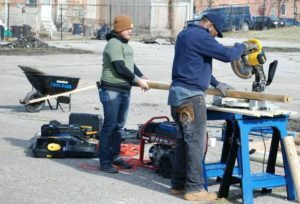 Established under the guidance of ToolBank USA in June 2012, the Baltimore ToolBank was the third affiliate to open its doors to the community. Today, 8 city-based ToolBanks sling #ToolsForChange in communities from coast to coast. In addition, 3 mobile units deploy to disaster areas in the domestic US in times of need.